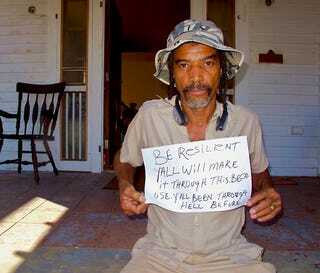 SandyKatrina is a new Tumblr showcasing photos of Hurricane Katrina survivors holding up letters of encouragement for those suffering to get through the aftermath of Hurricane Sandy. "Be resilient Y'all will make it through this because y'all been through hell before" says one Lower Ninth Ward native. "It's not about the material things it's about each other!!" says a former evacuee. "If anyone can understand, I can. I've been here before," says another born and raised in New Orleans.